Originally settled by loggers, farmers and trappers, Clarenville was established in 1891 by the amalgamation of the settlements of Lower Shoal Harbour, Dark Hole, Brook Cove, Broad Cove and Red Beach and was originally known as ‘Clarenceville’. While there is dispute as to who ‘Clarence’ actually was, the current town name was quickly adopted by the residents and has remained over the years. Since its establishment, Clarenville’s location, deep water port and weather have contributed to both population and economic growth. The Reid Newfoundland Trans-Island Railway was the first enterprise to capitalize on the Town’s location. 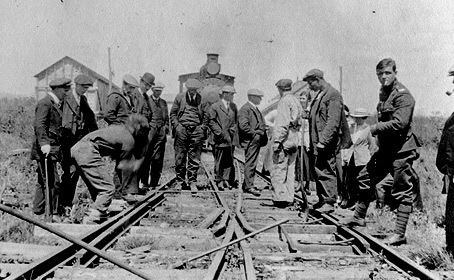 Reaching Clarenville in 1891, the railway terminal was the first of five terminals constructed in Newfoundland. In 1911, the role of Clarenville was reinforced by the opening of the Bonavista Peninsula Branch Line, marking Clarenville as a “hub”. 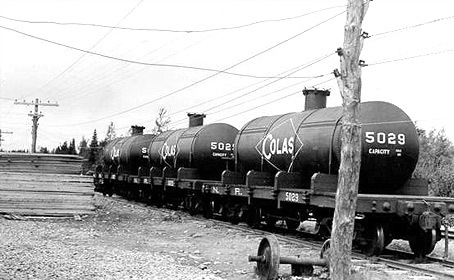 Opportunity for diversification of the economy was capitalized on in the late 1930s; Colas Newfoundland Ltd. was established to produce asphalt for the runways at Gander, St. John’s and Stephenville. The plant was later sold to Flintcote Company and a creosote plant was used to preserve railway ties. In 1955, the plant was purchased by the Newfoundland Government and renamed Newfoundland Hardwoods Limited, a Crown Corporation. 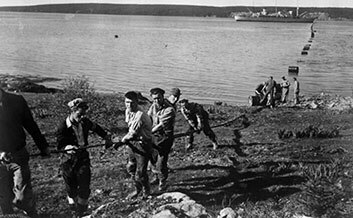 Clarenville’s deep water port and sheltered harbour attracted the establishment of the Clarenville Shipyards in 1942 by Commission of Government. These two enterprises, the Shipyard and the asphalt/wood preservative plant, triggered the growth spurt of the late 1930s and early 1940s. These firms, together with the railway, provided the industrial base for the entire area, especially in the nearby community of Shoal Harbour. Voices Under Water: Great Britain, the United States and Canada chose Clarenville as the location for the first Transatlantic Telephone Cable (TAT-1) in June 1955. The Town was chosen due to its seclusion from the open ocean which afforded shelter from fierce storms and water deep enough to prevent boats from harming the cable. Clarenville’s residents are proud of this distinguishing event. On June 22, 1955 the Town declared a municipal holiday to celebrate the landing of the cable and the opening of the newly constructed cable station on what is now Cormack Drive. On September 25, 1956 at 11 AM EST, the inaugural call was made; a conversation between the British Postmaster General, the chairman of AT&T and the Canadian Minister of Transport. Clarenville was also the site of the second transatlantic cable in 1959. This link was similar to the earlier one and was named TAT-2. The eastern terminus was however in Penmarch, France, giving North America a direct telephone cable to the European continent. On July 26, 1933, the largest armada of aircraft to make a transatlantic flight landed in Random Sound. This accomplishment put Shoal Harbour in the international spotlight. Pioneering aviator, General Italo Balbo and his fleet of twenty-four seaplanes landed at Shoal Harbour to complete the last leg of their spectacular flight from Orbetello, Italy to the Chicago Century of Progress Exhibition. Balbo Drive and the former Balbo Elementary School (now Riverside Elementary) were named in honour of this occasion. 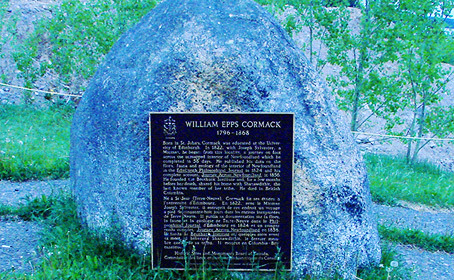 William Epps Cormack was born in St. John’s on May 5, 1796. He set out from Random Bar (now known as Milton) on September 5, 1822 with a reluctant Micmac guide, Joseph Sylvester, to try to establish friendly contact with the vanishing Beothuks in the unexplored interior of Newfoundland. He failed in his mission but he did become the first known white man to walk across the Island of Newfoundland. Since its incorporation in 1951, the Town of Clarenville has become a hub for a large number of federal and provincial government departments and quasi-public sector agencies. These serve the regional population, ascertaining the Town as a service centre for the region. On the private sector side, the construction and opening of the Come By Chance Oil Refinery in the early 1970’s created growth and an increased demand for services. The service demands of the existing industrial enterprises, the new refinery and the expanding public sector (and the individuals employed there) resulted in a rapid expansion of the personal services sector over that period. Clarenville continues to provide services for resident and business within the town and the surrounding area. A number of “mega” construction projects in the Town’s vicinity from the early 1990’s to present continue to contribute to population and private sector growth.